I put 72km on my new R340 today. It is really great; smooth and comfortable, it seems to glide along with less fuss than my carbon bike. The most noticeable feature is its cornering ability. I'm not a confident descender, but the R340 took me around downhill corners around 5km/h faster than normal and felt more sure-footed. I'm sure I'll get even faster as I get used to it. I can't speak highly enough of my new r340. Since making the switch from a stiff carbon frame I can safely say my enjoyment and passion for riding has only gotten stronger. I can't thank Andy & Nick enough for their time and effort that has gone into building my bike. Their wealth of knowledge of all things cycling is unparalleled and they're an absolute pleasure to deal with to boot. The bike is unbelievable! Stiff yet comfortable on long rides, responsive & fast. The ride quality is incredible. This bike has been an investment for the future for me. I can't see myself riding anything else for a few years to come as it's that good! If you're 50/50 to switching over to titanium, get into the shop and give it a go. You won't be disappointed. I highly recommend the Lynskey and bikepro experience to anyone who hasn't been in to try it. It will definitely broaden your cycling horizons. Titus Andronicus – a bicycle fit for a king. The Titans have a lot to answer for, immortal giants of incredible strength, the name has been passed through eons of time where it has been used by football teams, ships, rockets and popular media. Long before football teams and rocket-ships, the Titans name was adapted by the discoverers of a transitional metal of incredible strength and titanium was born. That was towards the end of the 18th century, some 100 years before the bicycle was invented and 200 years before the metal would find its way into bicycle frames. There comes a time in every cyclist’s life when thoughts of upgrading the bike begin to permeate the day. For me it comes around annually when the latest crop of carbon fibre machines hit the floor at my favourite bike shops. The carbon-fibre machines spruik improved geometry, updated graphics and the latest in styling which often stokes a burning desire to get aboard the latest fashion. Some of my friends upgrade each year and bicycle envy frequently takes hold. Usually I resist the temptation, comfortable in the knowledge that next year it will all happen again and maybe then I’ll be in a better position to shell out roughly two months of my hard-earned wages. The keyword above is ‘fashion.’ Like clothing, cars, furniture and other icons of haute couture, bicycle fashion now changes on a seasonal basis, aided and abetted by the plasticity of carbon fibre. Bicycle frames are in a constant state of change, purportedly seeking improved aerodynamics, strength and geometry intended to make this year’s frame faster and better than last year’s. It would more accurate to say the manufacturers are in a constant state of vogue. But what if I chose not to be a part of the high fashion bicycle culture? What if I want a bike that has not really changed since it arrived perfectly in the late 19th century? Well, the answer lies in steel, or, more specifically, titanium. By way of disclaimer, I should add I am a big fan of steel. In the past five years I’ve had carbon fibre bikes elevate me to previously unrealised levels of sporting endurance and achievement and have enjoyed my greatest successes on the plastic fantastic but the inherent joy in jumping back onto my trusty steel Colnago Master never wanes. I love the look of the bike, the attention to detail, the hand-painted, airbrush design and the diamond- shape tubing. But, most importantly, I like the ride and the feedback that comes through the bars and frame. After five years of Ironman competition my carbon bike was feeling twitchy and tired. Such feelings are most likely in my imagination but a few months ago the bike got the wobbles on a 60 km/h downhill. Friends that witnessed the event thought I was a goner, I did too and upon arriving home I parked the bike up, never to be ridden again. With the carbon bike consigned to the back of the bike room I once again returned to the steel Master whilst I contemplated a new machine. I read and researched everything I could get my hands on. I emailed manufacturers and spoke to friends and strangers about their chosen ride. Although I was maintaining a veneer of objectivity, the small flicker of a titanium torch burned in the recesses of my mind. Once confined to the realm of space-travel and military hardware, the end of the Cold War freed up world stocks of titanium, making it more available for commercial application. About twenty-something years ago I paid an extraordinary amount of money for two titanium spigots that served as pedals. Aside from being expensive they were a dismal failure but I prized and persevered with those two pieces of useless metal long after they became redundant simply because they added a modicum of exotica to my aging machine. Fast-forward twenty years and titanium has positioned itself as a contender for the whole of bike. Juxtaposed between carbon and steel, titanium offers durability and a super-high strength to weight ratio. I’ve been through various compositions of steel, aluminium and carbon. Evolution dictates I needed to at least consider exploring the final frontier in frame manufacture and the further I explored the more interesting things became. Cycling hyperbole never fails to produce great claims around almost every material component and technical aspect of cycling. Add the alchemy of exotic metals to the mix and my research was leading to a bicycle that was going to make rough roads smooth, flatten hills and increase my top speed. Titanium frames are renowned for being both stiff and smooth, I struggled with the paradox but I was also intrigued. The roads I take on by twice-weekly 110 km commute are course and uneven. With coarse aggregate re-surfacing that has been carried out earlier in the year I’d begun to think I should invest in mountain bike just for riding to work. Frequently in the afternoons I take the long way home to enjoy a smoother, although slightly longer longer ride. With Ironman training and general cycling events I’m riding close to 10,000 kms per year so anything that might look after my aging body was worth considering. The only way to experience and compare frame styles and materials is to ride them, lots. A simple lap around the neighbourhood of the local bike shop won’t do. The machine needs to be ridden through all conditions to get an appreciation for it. To this end, I resolved to gain the experience of titanium ownership. Without getting too bogged down in specifications, I went for an extra-large Lynskey R340 with Easton EC 90 forks and seat post, Shimano Ultegra groupset and SRAM Carbon cranks. 50 mm Shimano aero wheels finish things off. The machine is uncluttered and purposeful. The titanium and alloy sit well with each other in both operation and aesthetics. The tubes are an unpainted, matt finish and orange anodizing highlights points around the bike which gives it my personal touch. Speaking of the personal touch, some manufactures will inscribe the frame with the rider’s name, mine isn’t but had I been given the opportunity I think I would have insisted on Titus Andronicus, a Shakespearian warrior general who abdicated the throne in favour of a good stoush. In moving from the look of the machine to the ride it is difficult to quantify the bike over my previous carbon ride as for some three or four months leading up to the purchase and build of the Lynskey, I was riding my steel Colnago Master. As much as I enjoy my Colnago I found I was struggling to stay with the group on our Saturday rides. In fact, I was frequently dropped. I kidded myself that I was tired, the gang (which includes my wife) where getting faster and I was probably getting slower. Whilst there may have been an element of these things present, once I got on the Lynskey I found myself back running with the pack. During my research into titanium I frequently read about the metal smoothing rough roads yet, paradoxically, remaining rigid during hard peddle strokes. Lynskey even insisted you could go out on one of their titanium bikes, complete a century ride (100 miles/160 kilometres) then go to the dance that evening. I like long rides and a good dance so maybe that swayed me. Another aspect that steered me toward Lynskey was the shape of the tubes. The diamond cross-section was similar in appearance to my beloved Colnago and it just looks strong. Added to that, are the exceptional welds. As one who has dabbled with both arc and gas welding over the years, I have nothing but admiration for anyone who can produce such beautiful quality joints. Lynskey has been in the titanium cycle business almost from the outset so good quality work was to be expected, however, the Lynskey frame is of exceptional quality which is to be admired and appreciated. Back on the saddle I’m finding the paradox is strangely true. I know its working because the bike is both comfortable and fast. I’m slipping along with grace and speed, my kidneys are not being pounded by the road surface and I’m enjoying every minute on my new machine. Well, almost every minute. The bike is not the answer to headwinds but it climbs well and inspires confidence in rapid descents. My carbon bike was fabulous to pump up a hill but the giant wobbles on a fast descent freaked me out. I’m too old to seek that kind of adrenalin rush but I do want to go fast and when I get the machine wound up in a 70 km/h tilt down a hill I prefer to sit on the bike safe in the knowledge that it’s not going to try and toss me onto the road. The Colnago has always been rock-solid on descents and, so far, the Lynskey is likewise sure-footed and confidence inspiring. 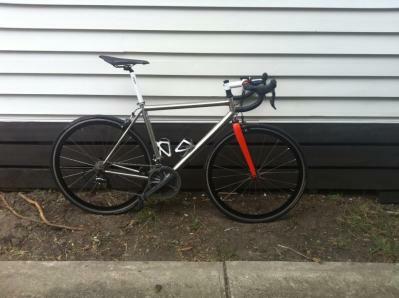 The Lynskey has now covered 1,000 kms and I am really enjoying the ride. Climbs, flats, wind and rain cannot dent my enthusiasm for this bike. Back in the day when steel reigned supreme, asked for his best training tip, Eddie Merckz simply stated “ride your bike – lots.” That is possibly the best piece of cycle advice ever and if you are going to follow it you should at least consider titanium, and, remember the Titans were immortal so your titanium bike will last a long, long time. Thus far I’ve avoided carbon fibre bikes, don’t really know why but I think the aesthetics of them may have something to do with it. Somehow they just don’t look right to me. Anyway I was in the market for a new metal bike to add to the other four when an article on the Lynskeys’ caught my eye. I already own a Ti bike which I ride a lot and I wanted another one provided it could give me some added stiffness. Andy from Bikepro convinced me that the R230 would be stiffer without sacrificing a whole lot of comfort which is a necessary aspect for me these days. ( yes ,I’m an old dog who’s been riding bikes for forty years ) So I got the R230 and I’m really happy with it. I havn’t raced it yet but it feels very responsive and lithe and the hand built wheels coupled with the new Schwalbe tyres give a lovely supple feel without any harshness. This bike handles a whole lot better than my old custom built Ti. It’s got a much tighter turning circle and feels more stable when leaning into corners. The semi compact frame design has afforded a different riding position from my other bikes in that I’m higher in the seat relative to bars. This makes pedalling seem more efficient, especially when climbing and it’s also comfortable. So bottom line is…. A very good bike for the money and half the price of my custom Ti. Why go and buy a Taiwanese big brand mass produced number that looks like crap when you can get on one of these? It’s a beautiful thing! Just wanted to say thanks. The R230 you built me is the smoothest, fastest, best handling and most comfortable ride I've ever had, and like all the bikes in your shop it looks just gorgeous. Weekend's just aren't long enough...happy riding!